This planting bed terrified an HOA. Why? Because too many of us are sold on turf as the only acceptable landscape aesthetic. Photo by S.D. Our 2012 Guide for Real Florida Gardeners features an article on “Going Native in Your Neighborhood” (pg. 3) and spotlights the Magrath-Perkins family, which ran into an almost insurmountable wall of opposition from their homeowners association (HOA) when they replaced a big chunk of turf from their front yard. This, despite the fact that the HOA had no requirement for a minimum percentage of sod, or any design requirements other than preservation of 20% of natural vegetation. This post includes some additional photos and information from the project. Karen keeps a notebook documenting her landscape project step by step, with photos showing how it evolves over time. Like many other families, the Magrath-Perkins household has been going green for a few years now – stepping up their level of composting and recycling, and reducing their use of energy and chemicals. 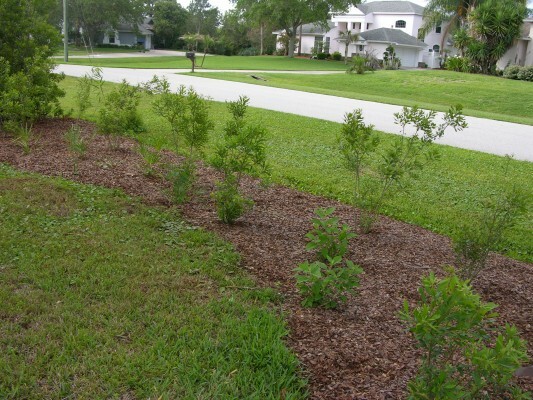 When looking at ways to save water, they realized that revamping their landscape was a huge opportunity. The large expanse of grass lawn used a lot of water and chemicals. A few years ago, a local garden center directed Karen Magrath to her local native nursery, where she picked up a copy of the Guide for Real Florida Gardeners. The guide featured an attractive upscale landscape with pines and palmettos. 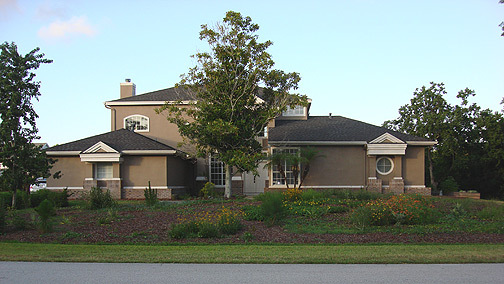 Karen saw this as a model for what her family could do, since their neighborhood was built in a former pine flatwoods. Karen decided she would create a self-sustaining planting bed in her front and side yards, and leave a border of turf to maintain some design consistency with the neighborhood. While working in her front bed one day, someone from the neighborhood approached her and told her she would have to put the grass back. Soon thereafter, she received a “cease and desist” order from her homeowner association’s Architectural Review Committee (ARC). The order precluded her from working in the yard, and weeds began to be a problem as time dragged on before a meeting with the ARC could be scheduled. Meanwhile, Karen’s homeowner association (HOA) called code enforcement, who did nothing, then the water management district, which confirmed that a swale can work just fine without grass in it, and then the health department, which required a costly application and approval process for the septic tank drain field, now grassless, to be mapped and approved for vegetation other than turfgrass. 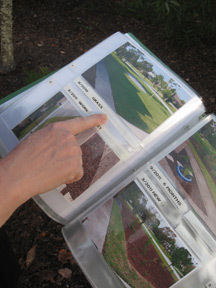 In addition, the HOA hired a landscape architect to review the landscape plan. Unfortunately, the ARC’s discomfort with the plan turned into a battle that dragged on for months and ultimately required the intervention of a lawyer and the Florida-friendly landscape law. In spite of the cost in money and time, the family persevered and has continued with their project. 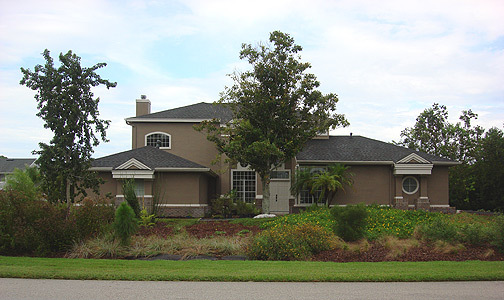 Ironically, in the process of submitting an application to her HOA ARC for approval of the landscape project, Karen learned that property owners were required to preserve 20% of their yards in natural vegetation. She pointed out that only after replacing the turf with natives would her yard actually meet this requirement. The Magrath-Perkins landscape, three months after planting, as summer begins. And six months after planting, with the first growing season well under way.